The route begins at the Roser square in Gombrèn, right in front of the church of “Sant Pere”. 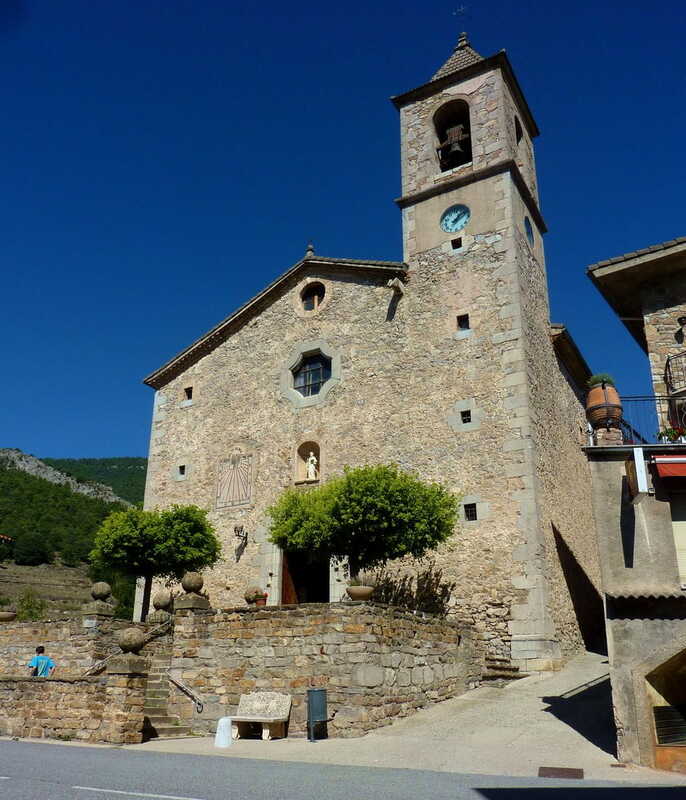 Follow the main road towards Campdevànol until you find the R53 sign Camí Ral just at the end of the village. Go down through the old trail that linked Campdevànol with the summer pasture fields in the Montgrony mountain range. The trail deepens leading you to a bridge over the river Merdàs. After crossing the river the trail becomes a little path amid the fields ending up in a wide track that you must follow to your left. You will pass by the farmhouses of “Can Macari” and “Cal Daldic”. Once you arrive at the R52 sign Caliquet you must leave the track to climb the terraces up until you will find a little path going deeper into a forest. The terraces and huts are an evidence that once all these mountains, nowadays covered by vegetation, had been cultivated. You will arrive at the “Vilamitjana” farmhouse, located on a hill. Follow the orange marks on a wide track going uphill. When you arrive at a big curve leave the track to take a little path climbing up to “Sant Quintí de Puigrodon”, a twelfth century church, nowadays severely damaged and covered by ivy. Pass by the “Can Bac” farmhouse and further ahead you will find the R48 sign Sant Quintí de Puigrodon. Climb up through the forest, first following a wide track and then a little path keeping an eye on the marks that will lead you to the “Coll del Vent” pass. From here follow a track to the “Sant Marc” farmhouse passing behind it and head towards the forest in a steep climb until you arrive on top of the “Sant Marc” hill. Once again, the orange marks will indicate the route. From here, the path becomes flatter and more gratifying. A few meters after thesummit you will pass by a natural viewpoint offering spectacular views over the northern mountains of the Berguedà county and over the southern part of the Montgrony mountain range. Just below you can see the “Puigbó” farmhouse, one of the targets of this route. Follow the yellow marked path trekking through the “Sant Marc” range on its sunny side until you will find a track leading to open fields. At this point you have to follow the blue marks that will take you up to the “Coll de Faig General” pass. Cross into the northern slopes of the range and head towards a hill where you will find the R49 sign Coll de Faig General. Descend through the shady side following the old livestock trail that linked the village of Alpens with the pasture fields of “Pla d'Anyella” up in the higher Pyrenees. A little further down you will arrive at the R50 sign Carena de les Girades from where you will rapidly descend to the “Puigbó” farmhouse where you can see the ruins of the Puigbó castle and its “Sant Martí” church surrounded by ivy. Head towards Cortal while following an old trail through the terraces. You will pass by “La Canal” farmhouse and a little further ahead you will arrive at a curve from where you have to follow a pathway entering into a forest. It runs along a couple of abandoned houses and leads to the small neighbourhood of Cortal, R56 sign. From here just follow down the paved road that links the neighbourhood with Gombrèn. You will enter the village by its sports area, R55 sign Camí del Cortal. One last climb will lead you to the main road and close to the Roser square, beginning and end of the route.